This summer I had the opportunity to study abroad in Costa Rica for five weeks. I am currently a sophomore majoring in physiology and chemistry with a minor in Spanish at the University of Arizona. I hope to use my degree to go to medical school and become a family practitioner. A Spanish minor will help me achieve my dream to be able to speak three languages — Spanish and my native English and Vietnamese — in order to better communicate with different people around me. 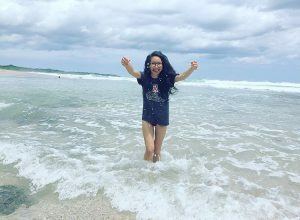 The reason why I wanted to study abroad in Costa Rica was because not only do I want to improve in my Spanish skills, but I also wanted to be immersed in Hispanic culture. I love to explore and to go on adventures that bring me out of my comfort zone. While in Costa Rica I took two Spanish classes which contributed six credits toward my Spanish minor, lived with a host family, and went on weekend excursions. It was the best five weeks of my life. I had many unique experiences and made so many new friends. It was really an unforgettable journey. Studying in Costa Rica this summer was an opportunity that I wouldn’t have been able to have if it wasn’t for the Earn to Learn scholarship. College alone is very expensive, therefore studying abroad is something I would never think I would be able to do due to my financial problems. Thanks to the reduced tuition and fees from Earn to Learn, I had the privilege to study abroad. They not only support me financially, they also help me learn how to save my money for things that are worth spending on. I am very thankful for this organization and I am proud to be part of this family.